What is the most effective way to combat frizz and achieve silky smooth hair? A keratin treatment from our Atlanta hair salon. Our Global Keratin treatments with Juvexin provide our clients with silky smooth hair with long-term conditioning and protection. This amazing keratin treatment creates manageable, frizz-free, beautiful looking hair that will last for months. During a keratin treatment at our Atlanta hair salon your hair will be washed with a special shampoo, to open up the hair cuticle. Then the keratin solution is applied to add keratin molecules into the hair. Heat is applied through straightening irons in order to seal the keratin into the hair allowing for smooth, shiny, frizz free hair. How does a keratin treatment transform hair? 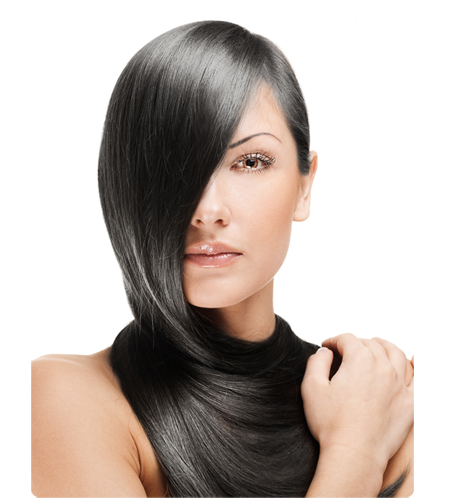 A keratin treatment is designed to make your hair look shiny and healthier. Your hair will also feel softer and smoother. Keratin provides a lot of nutrients for the hair and helps repair hair damage. Global keratin is not a chemical straightener so the amount of straightening will depend upon your hair type and other factors. You may still have a small amount of wave, but the frizz in your hair will be reduced and your hair will be much more manageable and smooth. A keratin treatment can last up to 2-4 months, depending upon how frequently you wash your hair. The keratin treatments that we use at our Atlanta hair salon are not permanent hair straighteners, and eventually your hair will go back to its normal state. For best results, do not shampoo your hair every day so that the effects of the keratin treatment will last longer. No, a keratin treatment is very different from a relaxer. A keratin treatment reduces frizz and revitalizes your hair.